The Shenandoah Valley Art Center, during the month of November, is exhibiting in the Cabell/Arehart Gallery the artwork of the Beverley Street Studio School. The exhibit demonstrates the diverse activities of the School, founded in January 1992. It began with an educational mission when a group of artists recognized the potential of an art school offering a program for the study of still-life, figure, landscape, and art appreciation classes and workshops. Initially begun upstairs in the historic Crowle Building, the BSSS started an invitational gallery and biweekly model sessions for a small fee. Travel programs began for students to study in the Southwestern USA, Italy, and France. In 1998, when street-level space became available, the BSSS members formed a cooperative and opened Beverly Street Galleries, composed of CoART Gallery and the School Gallery. In this exhibition, the School presents works by national and international faculty and students, as well as participants in other programs including travel study programs and model sessions. The school is currently operating out of the Stonewall Jackson School on Beverly Street in Staunton. In the SVAC Members’ Gallery, member artists will interpret the theme of “Figures” with works selected by the artists from their preferred medium. An opening will be held Saturday, November 5, 6:00 – 8:00 p.m. and the public is encouraged to come and meet the artists. Want to study art? Come learn the art of making Ceramic Christmas Ornaments for package or tree decorations. This adult workshop will teach you simple hand-building and glazing techniques to make holiday relevant shapes. Taught by Lynn Hilton Conyers on Tuesdays, November 8 and 15, 6 – 8 p.m. in the SVAC Pottery Studio with all supplies included. Are you a collector of Santa Clauses? The Felted Woodland Santa Workshop, taught by Karen Shapcott on Wednesday, November 30, 1-3p.m. at SVAC with supplies included, will teach you the art of wool felted sculptures. 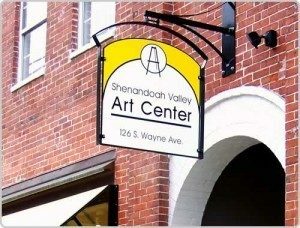 ($30) For the young artist, Shenandoah Valley Art Center offers, the ever popular Saturday Art for Kids, presenting a creative art experience for young artists. Designed as a program that expands upon art offered in school or as an art experience for the home schooled, the classes are taught by artists who are amazing with kids. All supplies and snacks included for children ages 6 – 10. Preregistration required. (November 5, 12, & 19, 10:00 a.m. – 12:00 p.m.,$15 per class). Looking for the unique and creative holiday gift? SVAC opens its new building at 416 W. Main Street for the 416 Holiday Market. Formatted like a farmer’s market, each artist will fill a space with their handcrafted artwork. This will be a fun and festive event to kick off holiday shopping. The first market will be November 3, 6-8 p.m., November 4 and 5, 10 a.m.-4 p.m. to be followed by a second market on December 8, 6-8 p.m., December 9 and 10, 10 a.m.-4 p.m.